Produce promotional materials for an annual charity event that describes the organization and its purpose. Advertise the event, recruit sponsors and encourage attendance among current supporters and those unfamiliar with the organization. Each year, the members of an intentional community of people with and without intellectual disabilities come together to celebrate another year of growth and recommit themselves to its future. Families, friends, volunteers and donors participate in the two-day Ranch Roundup, a golf tournament followed by an evening of good food and dancing. American Gothic, Grant Wood’s 1930 painting, has become one of the most recognized — and one of the most imitated — works of modern art. It has come to symbolize hard work and domestic life. It speaks of endurance and faith in the creation of a better future. This was and is the dream of the founders, parents of a child with Down syndrome, who toiled for decades to build this inspiring community. The founders are seen here in the classic poses of Wood’s iconic painting. 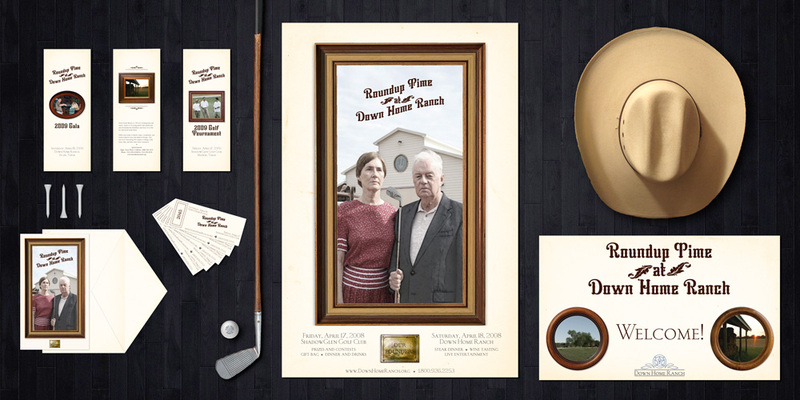 In the image created for this year’s event, a golf club replaces the husband's pitchfork — a humorous way of suggesting that, during this event, hard work is replaced by relaxation and celebration. To recreate the painting, the founders were posed in front of the barn that anchors the 340-acre property, and the image digitally altered to create a painterly effect. Other images were altered in the same fashion and placed in picture frames against a textured backdrop. These framed photos impart the feeling of walking into a home and finding images of loved ones hanging on the walls. The Ranch and its Residents are the subjects of these paintings; fitting tributes to the hard work done each year by every member of the community.